Congratulations 2015 Volunteer High School Winter Guard Members. Be sure to sign up for Falcon's Nest Reminders for upcoming information. Winter Guard finishes strong at Championships! The VHS Winter Guard finished it's competitive season at CIPA Championships at Western Carolina University. After getting promoted at Sullivan South, the VHS Winter Guard won first place in Scholastic AA class with a score of 72.36 at Halls. 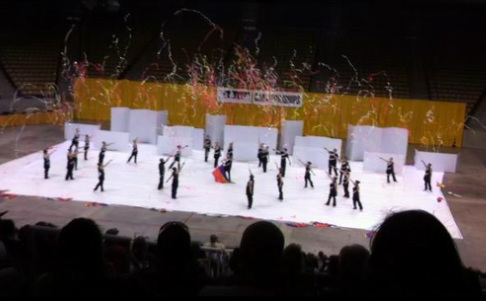 The guard finished 5th in its division at Championships. Congratulations on a wonderful season!! Winter Guard takes top honors at Sullivan South! The Winter Guard finally got to perform in contest on March 1st at Sullivan South HS. The Winter Guard competed in Scholastic Regional A Class and was awarded 1st place. Not only that, the Winter Guard was promoted to Scholastic AA class. Come and check us out at our remaining contests at Halls HS in Knoxville on March 22 and Championships at Western Carolina University on March 29th! Congratulations to all who auditioned for the 2013-14 Winter Guard. Audition Results can be downloaded below!! 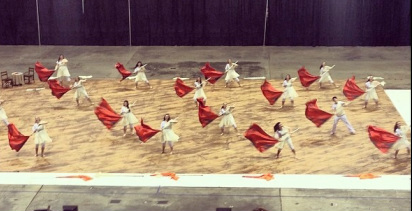 Congratulations to the 2013 Winter Guard on an amazing season!! Below you can download the PDF of the schedule for this Saturday's Championships at Western Carolina University! Below you can download the PDF of the schedule for this Saturday's competition at Karns High School! Below you can download the PDF of the schedule for this Saturday's competition at Tennessee High School! The VHS Band Boosters will present the Volunteer Indoor Showcase on February 23rd, 2013 in the gym at Volunteer High School. Admission is $8. Please come out and support your local Winter Guard and Percussion Ensembles as they perform their 2013 Programs. The schedule can be found on the link below. We hope that you can come out and join us for what we are sure to be a great day of performances by all the ensembles! We will be giving away a 50" HDTV, as well as other surprizes! Lippo's Music Mart will be on hand for all your guard supplies! We are also excited to have Southeast Independent Winter Guard who was the winner of the WGI Nashville Regional in Independent A Class! Come out for a great day of Pagentry Arts! Congratulations to the 2012/2013 Winter Guard. Click the file below to see the results of the auditions!